Time of Origin: President of the city of Stronghaven on the planet Draxine in the far future. History: Although Karnex had a positive reputation on his world when The Doctor first heard of him, being known for various welfare reforms and his attempt to extend the human lifespan with his 'Lifespan Project', he was swiftly revealed to be one of the most twisted geniuses The Doctor had ever encountered, thinking nothing of sacrificing thousands to further his own ambitions. In the beginning, Karnex was President of the city of Stronghaven on the Earth colony planet Draxine in the far future - Draxine being noteworthy for the fact that its orbital position left it experiencing perpetual twilight -, Stronghaven maintaining a positive trade relationship with its fellow colony city Garrak. This relationship was apparently destroyed when Garrak's President Harmon created a death cult, consisting of most of Garrak's population, and detonated the city's nuclear reactors to take everyone to a 'Grand Utopia', Karnex being assassinated by Garrak citizen Nia Bruske for his anti-Garrak measures after the explosion, with Stronghaven arresting Garrak citizens because of Harmon's actions creating doubt about their stability (Although Karnex's former vice-President, now acting President, secretly violated the Garrak arrest policy for his aide and lover Meera Darone, who had been born in Garrak even if she had been educated in Stronghaven since pre-school). 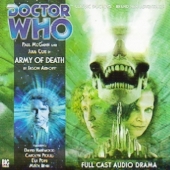 When The Doctor and Mary arrived at Stronghaven, they were quickly taken as 'hostages' by Nia as she attempted to escape to Garrak to find out if her husband had survived the city's destruction, only to find themselves confronted by the horror of an army of walking skeletons heading towards Stronghaven, the skeletons having already destroyed the first wave of defences around the city. With the skeletons proving impossible to fully destroy - even when shattered the bones continued to move -, The Doctor and Mary were separated when a group of hover-sentries discovered them, The Doctor being captured and taken to Stronghaven while Mary was forced to flee with Nia. At the same time, Vallan was attacked by something in his room, finding himself unable to leave as he was confronted by something that claimed to be Harmon, returned from death and claiming that he had dispatched the skeletons, regarding death as an impossible foe, ordering Vallan to reduce the city's defences to their minimal level or he would return for a less congenial conversation. Having arrived in Stronghaven, The Doctor was interrogated about the skeletons and his connection to Nia, although Vallan stepped in in time to stop The Doctor being mutilated, The Doctor explaining his history to Vallan and Meera while Vallan revealed that Nia was the one responsible for Varnex's assassination. The Doctor encouraged Vallan to abandon the paranoia that had been inspired by Garrak's destruction, offering his services in finding out the origin of the skeletons, also suggesting that the hover-sentries be reprogrammed to track movement in order to deal with the skeletons as their current infrared systems were naturally useless against the walking dead. Examing the footage of Karnex's assassination - knowing from personal experience ("The Deadly Assassin") that video footage of assassinations could be faked -, The Doctor determined that the Nia in the footage lacked the hatred of the one he'd met, but his investigation was interrupted by a new attack on the senate, the skeletons having penetrated Stronghaven when Vallan was forced to halve the city's defences based on the orders of 'Harmon'. With a new wave of skeletons attacking the senate building, The Doctor accompanied Commander Raynor to the Senate, puzzled at the purpose behind the skeletons' attack, advising Vallan to stand down the guards so that they could learn what the skeletons were after, recognising that they were basically worker ants after a specific goal. Examining a skeleton's skull with the sonic screwdriver, The Doctor realised that the skeletons were capable of a form of speech, using the sonic screwdriver to modify the skull's resonance so that it could communicate, with a Garrak identity-chip and the scorched nature of the skeletons confirming that they had originated from Garrak. As the skeleton begged The Doctor and Vallan to kill it, The Doctor realised that something was controlling it, requesting a laboratory to analyse the skeletons and sending hover-sentries after Mary, Vallan going along with the request despite the reports that Garrak had become radioactive since the explosion. Although The Doctor's analysis of the skull was interrupted when it suddenly exploded, he was intrigued by Vallan's tales of Harmon's supposed supernatural powers over the dead, but further explanation was cut off with the discovery that the skeletons were generating a force field as they assembled in the great hall that prevented anyone approaching them, with space for more skeletons remaining within the force field. Unable to take action there, The Doctor requested anti-radiation pulls and command of three hover-sentries so that he could go to Garrak and rescue Mary. Having arrived in Garrak, Mary and Nia were captured by a group of robed figures in, who took them to see President Harmon, the two women being led to Harmon's current location - a bunker hidden underneath a destroyed factory - shortly before The Doctor found them. Witnessing Harmon as a barely-living mutilated corpse linked up to various life-support systems and machines to communicate with the outside world after the damage he had sustained in the explosion, the three learned that the explosion had not been radioactive as the reports stated. As The Doctor talked with Harmon, he revealed that Garrak had been destroyed by Karnex, Harmon and Karnex having privately disagreed on virtually everything for years until an unmarked car appeared in the central square containing a bomb, Harmon having only just managed to reach his panic room before the bomb went off, decimating most of the city. With the discovery that something had taken control of Nia to provoke her attack on Karnex, The Doctor realised that something else was going on, but he was forced to flee with Mary and Nia when the skeletons of the factory workers who had been working at the time of the explosion attacked them, Harmon ordering his men to flee with The Doctor, Mary and Nia as The Doctor vowed to tell others the truth about Harmon. With the situation becoming worse at Stronghaven, Vallan having been deposed for 'incompetence' and Meera now forced to obey the entity posing as Harmon as a new wave of skeletons approached the city, The Doctor was able to take an abandoned hovercar back to Stonehaven, arriving just in time to see the skeletons attacking the city through the sewer system. As the skeletons assembled into a pile in the senate, they re-formed into a massive effigy, larger than the hall, which revealed itself to be Karnex, now reborn as a brand new deity through the victory of the Lifespan Project. Although the reborn Karnex easily crushed Vallan and Meera when they tried to defy him, The Doctor and his allies were able to escape when The Doctor used the sonic screwdriver to reconfigure the forcefield so that Karnex couldn't get out (Although he would eventually break it through sheer force). While Commander Raynor sought access to Karnex's vault and the technology within it, Nia was sent to find out additional information about the Lifespan Project while The Doctor and Mary confronted the contained Karnex. Talking with Karnex - who had now proclaimed himself the Bone Lord -, The Doctor, identifying himself as a man of science first, learned that the Lifespan Project allowed Karnex's 'psychic cloud' - essentially, his soul, although The Doctor noted that there was a line between the soul and the mind that it would be best not to analyse in depth under the circumstances - to be preserved elsewhere before his physical death, having sent his associates to Garrak before its destruction to prevent anyone else duplicating his work. The bomb that destroyed Garrak was laced with the same psychic isotopes used to duplicate Karnex's soul, allowing him to link his mind to the bones of the dead, although it took time for him to learn how to control them to the extent required for his plan to work; his 'assassination' had been a deliberate action to make himself a martyr and ascend to his current state of power, where he would reduce everything to purity and simplicity as he was worshipped by the masses. With the forcefield collapsed, Karnex attempted to attack The Doctor, but was delayed by the hover-sentries long enough for The Doctor and Mary to escape and join their friends. Examining the machine responsible for the Lifespan Project, The Doctor resolved to link himself up to the machine, hoping that he would be able to fight Karnex for control of the bones he was using as his body. However, while The Doctor was distracted by his attempt to reason with Karnex, Nia connected herself up to the machine, knowing that it would kill the user and concluding that it was better for her to die after she had lost everything rather than allow The Doctor or Mary to die when they still had each other. Karnex initially believed that Nia lacked the power to oppose him, but The Doctor noted that the dead were more likely to 'sympathise' with Nia as one of their own rather than continue to obey their murderer, resulting in Nia taking control of Karnex's body after his mind was dispersed. Nia subsequently took the Bone Lord's body to the edge of the cliff near Stronghaven, falling off it to end the Bone Lord's nightmare. The Doctor and Mary departed, confident that Garrick and Stronghaven would rebuild after this catastrophe, although they both grieved the loss of the friends they had made during this struggle.